Can't Fix It? Feature It! My wife and I are particular, so when it comes to subjects or projects we don't understand, we educate ourselves. 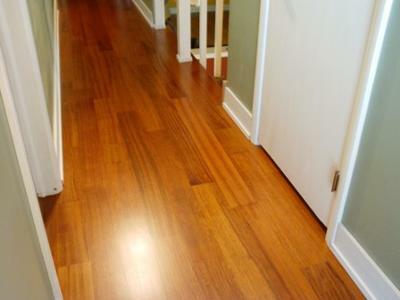 When it came to putting in Brazilian Cherry hard wood floors, (a significant project,) we conducted 5 interviews with various companies and people before we decided to go with our Floorwright, Jerry. He was helpful in our data gathering process explaining that we didn't have the OTB (I learned this from the Internet - Open To Below) that I self diagnosed. In fact, I was wrong about darn near every one of my concerns as Jerry calmly walked me through the process. We could not have picked a better guy. The floors are beyond gorgeous. As my mother-in-law said, "They are furniture." 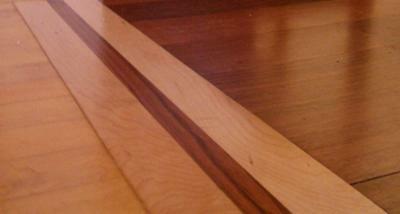 I have only met a few master craftsmen in my life and Jerry is one of them. If you want your floors to look awesome, for a fair price, knowing you get a master craftsman, who even keeps the dust to a minimum, Jerry is your man. We couldn't be happier and I cringe to think one of my options was a "Lumber Liquidators" and a do-it-yourself-project. My pleasure. Thank you for your kind words. A couple of things I'd like to mention for the readership. I have a very short list of Brazilian Cherry mills that have proved to me to be responsible...more concerned about the quality and consistency of the product than flooding the product for price competitiveness. If we are going to be cutting down trees in South America to supply North American Brazilian Cherry demand, then I want some assurance that all parties involved are responsible-types. Everything I recommend on this site has been proven with time. I only mention the old names because I trust them. Robinson Lumber milled this material. Be that as it may, the homeowner and I are the last links in the "chain of custody". Fussing over sustainable forestry and careful distribution only to horse up the floor with shortcuts in the end is like dressing your kid warmly to go play in the street. I salute these homeowners for shopping carefully, for supporting a legitimate lumber company, and for allowing me to deliver and acclimate and install the material for its longest possible life. In regards to the if-you-can't-fix-it-feature-it photo, above...when changing wood species from room to room, look for appropriate ways to transition. This simple pinstripe idea is one way to add a design element, (not too cute for the room,) that is just enough to say, "Yes, we meant to do that." 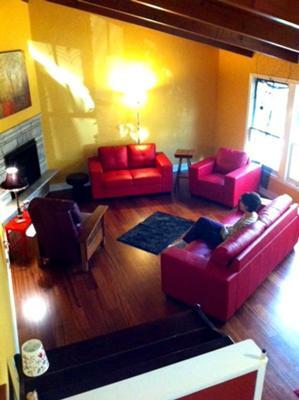 When, in reality, you were just saving some bucks by not abandoning the old floor and replacing it with new. Secret's safe with me. Only your Floorwright needs to know. 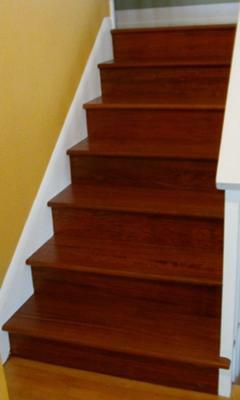 Here's to the longest life of your Brazilian Cherry wood floor and staircase, Haines Family. Join in and write your own page! It's easy to do. How? Simply click here to return to Post Its.